250 mm diametre semi-pneumatic grey non-marking drive wheels and 125 mm non-marking polyurethane castors, all swivel. With a load capacity of 400 kg, the UltiMate trolley features both a powered lift and powered drive system, removing the need for manual pushing or lifting. Its central drive wheels make it ideal for use in confined spaces. With a lift height of 1600 mm it is suitable in many applications to safely manoeuvre loads to various work heights. 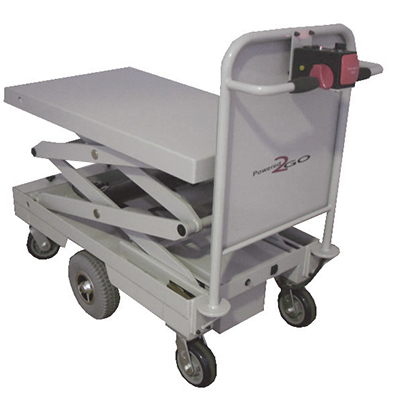 Fitted with 250 mm diametre semi-pneumatic grey non-marking drive wheels, and 125 mm non-marking polyurethane all-swivel castors, it is easy to use and highly manoeuvrable.